Under contract to the U.S. Army Corps of Engineers, Aspen Environmental Group prepared a joint Environmental Impact Statement/Environmental Impact Report (EIS/EIR) for the Imperial Beach Shore Protection Project. 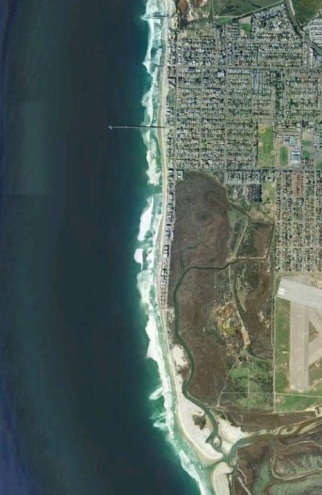 The project involved initial beach nourishment followed by periodic replenishment of an estimated 7,100 feet of shoreline in Imperial Beach, California. Implementation of the project and alternatives involved two offshore borrow sites for beach fill using either a dredge with a stationary hydraulic pipeline or Hopper dredge. Under the proposed project the base beach fill involved the placement of 1,587,912 cubic yards (cy) of sand for a total beach width of 39 feet, followed by renourishment with 999,312 cy of fill every ten years to maintain that width over a 50-year period. Action alternatives to the proposed project evaluated in the EIS/EIR included varying amounts of fill over the same 50-year timeframe for various beach widths ranging between 82 feet and 177 feet. No hard structures for shore protection were proposed. The EIS/EIR analyzed 13 topics and included evaluation of off-shore, near-shore, and on-shore coastal processes, Essential Fish Habitat (EFH), water quality, and near-shore, estuarian and terrestrial biological resources. Aspen also prepared a Mitigation Monitoring Plan, a Clean Water Act Water Quality Evaluation and a Coastal Consistency Determination, including support at Coastal Commission hearings. The EIS/EIR identified the Environmentally Preferred Alternative, as well as the National Economic Development Plan Alternative and the Recommended Plan Alternative. The EIS/EIR also included an analysis of compliance with all applicable federal, state and local regulations. In addition to support at Coastal Commission hearings, Aspen participated in the project’s public scoping meetings and meetings on the Draft EIS/EIR.